CasinoLuck will be hosting an extreme cool free spins raffle where you can win your part of nothing less than 10,000 free spins to the Starburst Video Slot! Are you ready for a great promotion that they’re running this week at CasinoLuck? 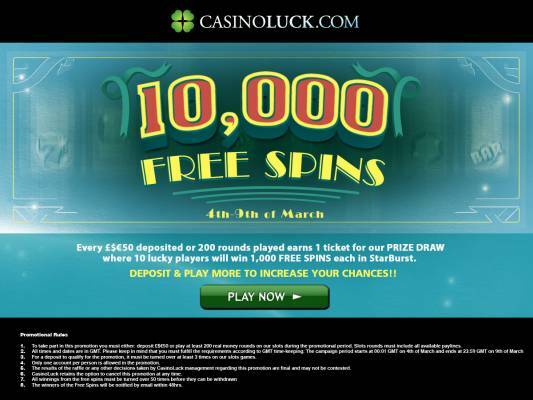 The casino will be giving away a total of nothing less than 10,000 free spins. To enter, all you have to do is deposit $50 or play 200 rounds in their slot machines. For every $50 deposited or 200 rounds played during the promotional period, you will be given a ticket for a raffle where 10 lucky winners will each win 1,000 free spins in the video slot Starburst from Net Entertainment. The more you deposit or play, the more tickets you will be given for the raffle and the higher chance you willl have of winning the free spins! The promo ends tomorrow, on 9th March 2014, and CasinoLuck will be informing the winners within 48 hours of the period’s end. So how do you get your hands on part of the 10,000 Starburst free spins? 1. Sign into your Casino Luck account. 2. Make a minimum deposit of $50 or play at least 200 rounds on any video slot to earn your tickets to the draw. The more you deposit or play, the bigger the chances of winning. That should be easy to understand! 3. Winners will be notified by email 48 hours after the end of the promotion. Please note that any deposit made towards this promotion will need to be turned over 3 times to qualify for a ticket into the draw, and only one account allowed per person, household and ip.